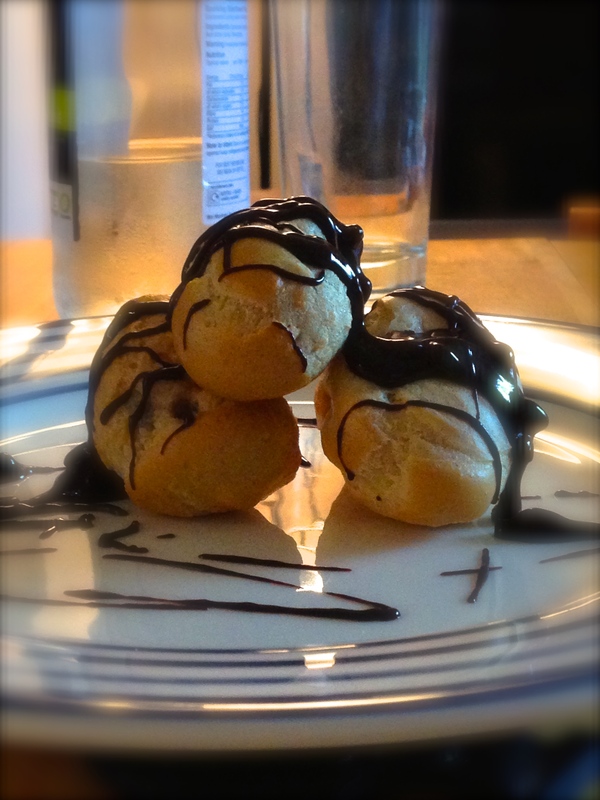 I used to LOVE profiteroles and they were something I had accepted I would never be able to eat again. A big part of this was a lack of confidence making any sort of pastry dairy free, plus being stuck about what to fill them with. However, after watching an episode of the Great British Bake Off and getting a lesson in how to make custard from my mum, I felt I should be brave and at least try. And I’m so pleased I did – because they were a lot easier than I thought they would be and were SO tasty. These were a complete first attempt as I had never made choux pastry, or crème pâtissière and I’m pleased to say that I succeeded! 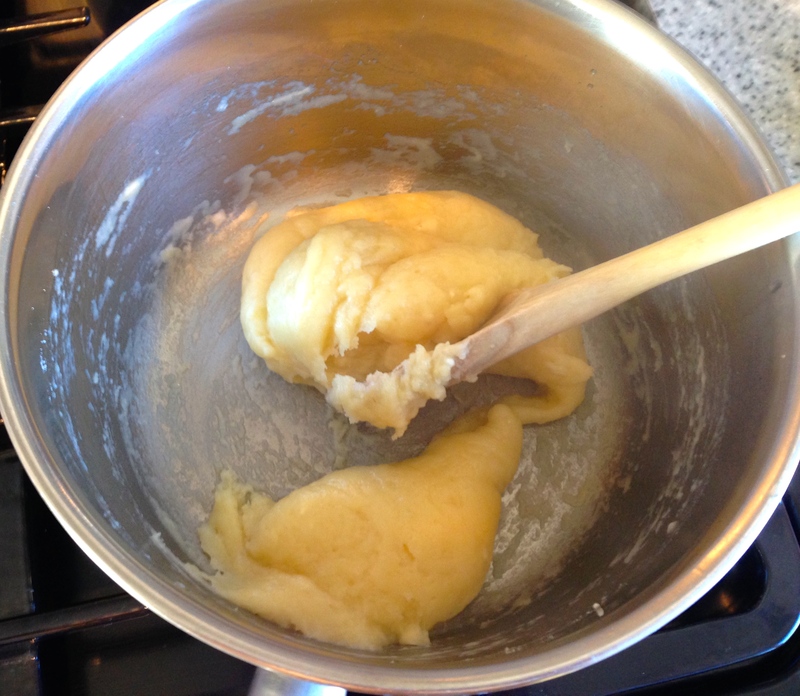 Choux pastry is a great thing to know how to make, and really not as hard as you think. Once you’ve mastered the recipe, you can go on to make eclairs, or cream puffs (with a different filling of course) or even savoury gougères. 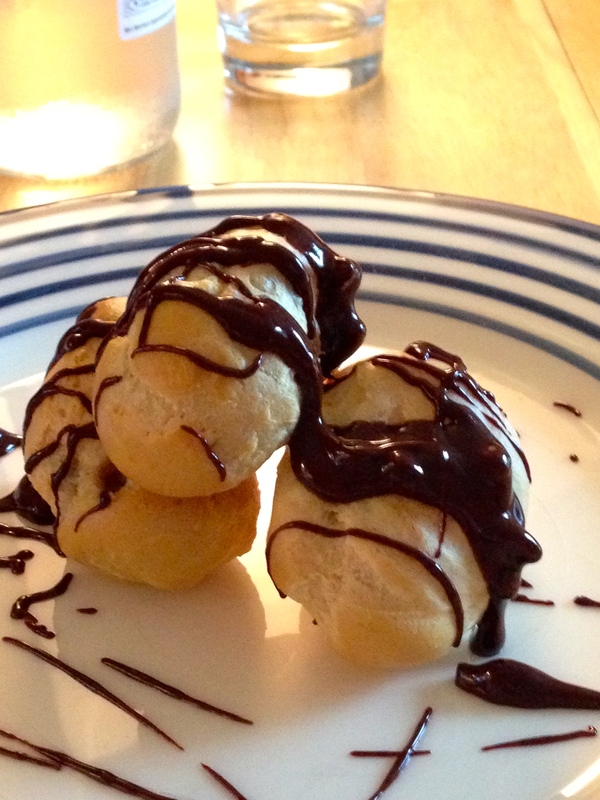 From the vast amount of research I did on profiteroles, I found that two things are key. Get a lot of air in the dough by whisking more than you think you’d need to as you incorporate the eggs. This helps them rise and become very hollow in the centre. Add steam – the simplest way to do this is to ensure you do not evaporate off too much water when you create the dough and to shake water over your profiteroles before you bake them. It sounds mad – but steam is the raising agent in choux pastry. The crème pâtissière was the perfect filling for the profiteroles and the hazelnut flavour from the milk was deliciously complimentary with the chocolate sauce. No one was missing the cream 🙂 Although the milk carton (I used Alpro) does state ‘not for cooking’ I did not find any issues with the flavour or texture of the milk once heated. I can see myself perfecting my creme pat as it is such a versatile filling for desserts… so expect to see this again! I was concentrating hard on these as I cooked (we had my boyfriend’s parents round for lunch and there was no back up dessert – so the pressure was on! ), so forgot to take good step by step photos as I went. Next time I make these I will write a ‘how to’ post with better step by step instructions so you can all enjoy some perfect homemade profiteroles. Takes 2 hours 30 minutes, plus 1 hour cooking and cooling time. Sift the flour onto a piece of paper or plate (this is important as it allows you to get the flour into mixture quickly). Line a large tray with baking paper – fix it down to the tray with a little dough in each corner. Fill a piping bag with the choux pastry and using a large nozzle, pipe the choose pastry into profiteroles. I piped mine about the size of a 10 pence piece. Leave about 5 cms all around each piped profiterole. 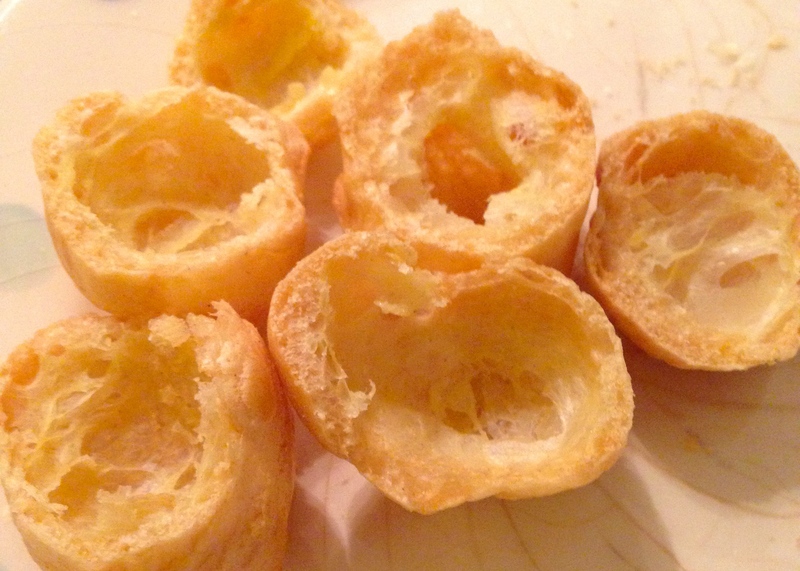 When all have been piped (I made 23), use a wetted finger to smooth each profiterole over. Spray some water over the tray of profiteroles – I didn’t have a spray bottle, so made my hands wet and shook them over the tray. Place the profiteroles in a preheated oven at 200 degrees. Bake at 200 for 10 minutes, then lower the temperature to 180 degrees for a further 25 minutes. At this point, take out one of the profiteroles from the oven and cut open to test. 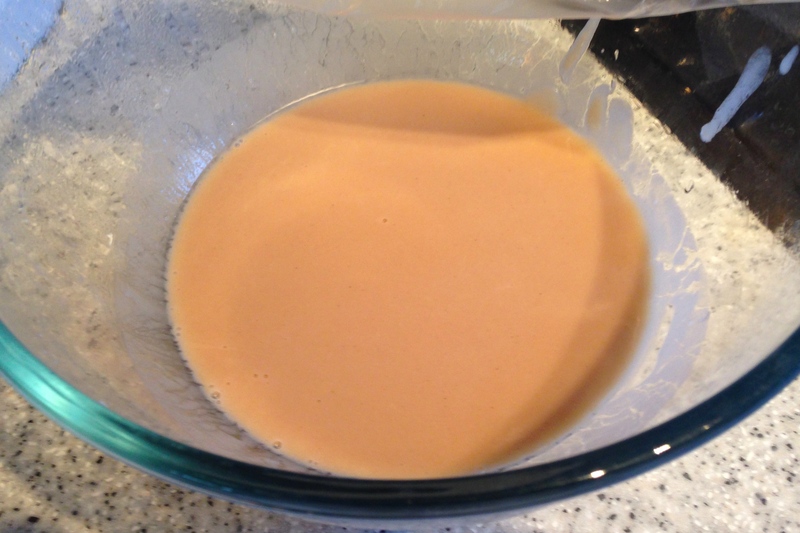 Inside the profiterole, the pastry should all be dry. If it is, move onto the next step. If not, keep the profiteroles in the oven for another 5 minutes at 180 degrees. Fully cooked profiteroles with a dry, hollow centre. Turn the oven off, and remove the tray of profiteroles. With either a sharp knife or small metal piping nozzle, pierce a hole in the bottom of each profiterole. Place the tray of profiteroles back in the warm oven. Leave them there until the oven and profiteroles are cold. The choux pastries are best eaten on the day made. Alternatively, freeze them and when required refresh them in a hot oven for a few minutes once defrosted, cool and then use. Whisk the eggs and sugar together in a large bowl until pale and creamy and the mixture leaves a trail when you lift the whisk. Pour the mixture back into the pan used for the milk. Over a low heat, stir until the mixture boils. This is important, as it is when the mixture boils that the flours will thicken the mixture properly. Keep cooking for another 2 to 3 minutes, then take off the heat and cool thoroughly. Fill a piping bag with the crème pat and using a small nozzle fill each profiterole. Be careful not to overfill or they will burst. In a glass bowl add all the chocolate sauce ingredients. Place the glass bowl over a saucepan with a filled with a few cm of water over a low heat. Carefully melt the chocolate and other ingredients until you have a smooth, shiny sauce. Serve the profiteroles topped with warm chocolate sauce for a delightful and special dessert. Thanks Pure! And thank you for running the #bakedairyfree competition. It’s great to see so many people getting involved and showing that baking dairy free can be possible and delicious!